Kensa strikes a pose at home. KENSA will make her debut at Richmond this Saturday when she contests a fifth grade event over the 400m trip. Trained by Michael and Jodie Manuel, Kensa has made a brilliant start to her career, with two starts resulting in two wins including a sizzling 22.68 success at her first race start at The Gardens. The daughter of Spring Gun and Little Bit Fancy followed up that performance with a tough 23.03 win last Friday where she showed plenty of ticker to find the front and seize the win after missing the kick from box two. Jodie Manuel reported that Kensa pulled up a bit sore following the run, but expects her to be spot-on for her trip to Sydney. “She had a couple of little injuries following her win so she has had to have the week off,” Manuel said. “She got needled in the right pin and the left hip, but she got checked again last night (Wednesday) and she got the all clear. 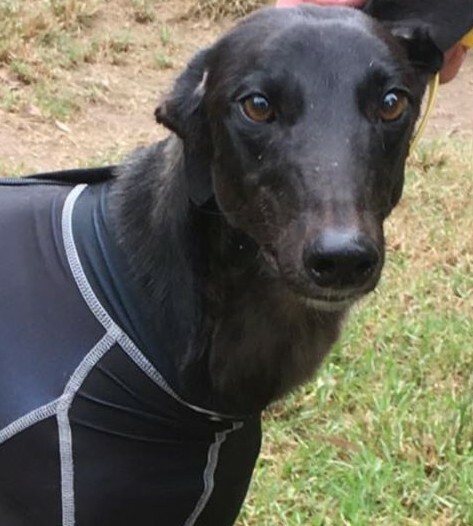 Kensa will be facing a tough field on Saturday, up against greyhounds which have more experience and have clocked fast time including Monsignor Ace (box one), Speed Sign (box two), Sketchy Fanta (box five), Zambra Icon (box eight). Manuel said Kensa, affectionately known as Coco, will have to be at her best, having not had a look at the track prior to the race. “We like to give our dogs a look at the track prior to racing them, but with her pulling up sore she wasn’t able to trial. A look at Richmond is vital for Kensa, Race A Chaser’s pocket rocket nominated for the 2016 Richmond Riches race series which is coming up in May. Run over the 535m trip, the series is worth $100,000 to the winner, with Kensa sure to be in the mix due to her dazzling early speed. Syndicate Manager Tatum Osborne Young said connections were excited to see what Coco is capable of at her first start at Richmond. “Coco could not have been any more impressive so far throughout her career and we think she has a very bright future,” Osborne Young said. “While it is a hard race this week we think Coco will run well and we know she will be trying her best. “It will be good for to have a look at the track, with everyone hoping that she will be competitive in the Richmond Riches series. For more information on Kensa or to purchase a share please contact Syndicate Manager Tatum Osborne Young.